The first detailed study of what happened in Britain when the East India Company acquired a vast territorial empire in South Asia. It offers a reconstruction of the inner workings of the company as it made the remarkable transition from business to empire during the late-eighteenth century. 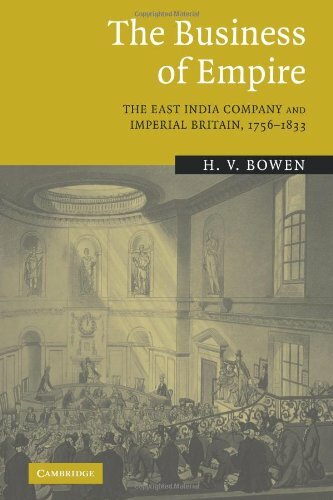 The Business of Empire assesses the domestic impact of British imperial expansion by analysing what happened in Britain following the East India Company's acquisition of a vast territorial empire in South Asia. Drawing on a mass of hitherto unused material contained in the company's administrative and financial records, the book offers a reconstruction of the inner workings of the company as it made the remarkable transition from business to empire during the late-eighteenth century. H. V. Bowen profiles the company's stockholders and directors and examines how those in London adapted their methods, working practices, and policies to changing circumstances in India. He also explores the company's multifarious interactions with the domestic economy and society, and sheds important new light on its substantial contributions to the development of Britain's imperial state, public finances, military strength, trade and industry. This book will appeal to all those interested in imperial, economic and business history.